Natural Environmental Protection Logs, No Formaldehyde, No Mites, 360° High-temperature Carbonation, Anti-corrosion, Mildew, Sunscreen. Steel Screws Fixed, Solid And Reliable, Simple Assembly, Protection Of Sturdy And Stable Flower Racks. Base Separation Design Is More Advantageous To The Free Control Of Bonsai Space. Vintage Art Flower Racks, Decorate Your Courtyard And Room. Natural Environmental Logs,Formaldehyde Free,No Mites,360high Temperature Carbonation,Anticorrosive, Mould Proof ,Sun protection. 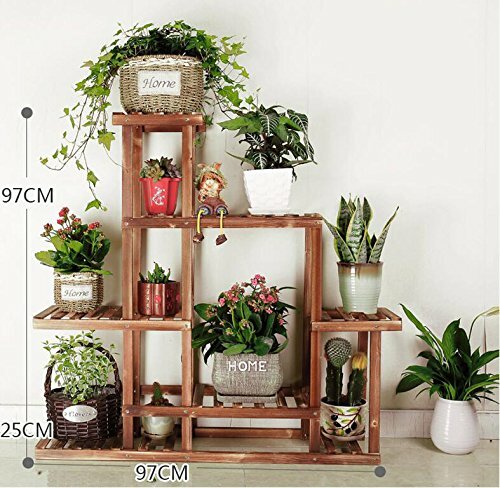 Steel Screw Fixing,Solid And Reliable,Simple Assembly,Protect The Flower Racks Solid And Stable.base Separation Design,More Advantageous To The Free Control Of Bonsai space.